Additionally alarm systems that rely on police departments to carry special equipment to track a stolen motorcycle will work only within the jurisdiction of that police department, if the stolen motorcycle is beyond that police department it cannot be tracked. The truth is that motorcycle theft happens just about anywhere which is why you need a system that can track just about anywhere. SXnavo Theft Control System works everywhere in every state so that no matter where a theft occurs, movement can be tracked and reported within minutes of a theft. 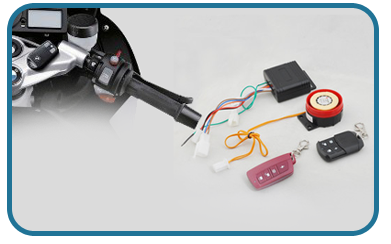 When the SXnavo theft control system is armed, the motorcycle’s electrical system is shut down, using the inbuilt immobilizer; the bike cannot be forced to run even with the key or the ignition in the ON position. The SXnavo Theft control and tracking unit will send a point of activation signal to the monitoring center (showing the time, date, and location of the motorcycle). If someone attempts to move the motorcycle, while the SXnavo is armed, in any direction the 3D accelerometer can detect the movement and immediately send an alarm signal to the secured servers. When the server receives the alarm message it will send a text message to your cell phone and the designated cell phones you have chosen while at the same time forward the alarm message to the monitoring center. At the monitoring center one of their highly trained operators will contact you and ask you to verify whether your motorcycle is stolen or had a false alarm. If the motorcycle is confirmed stolen, the operator will then send all the locational details about the area the theft took place and give you the exact location, direction, and speed of your motorcycle so it can be quickly recovered.